Chadmoore Wireless Group, Inc. (Ticker: MOOR), the country’s second largest holder of specialized mobile radio licenses, provides wireless dispatch communications service to secondary and tertiary markets throughout the United States. In 1999, Chadmoore generated approximately $6 million in revenue. The SSG Group of Berwind explored all of Chadmoore’s strategic alternatives, including senior debt refinancing, an equity infusion, merger & acquisitions and a sale to a strategic acquiror. 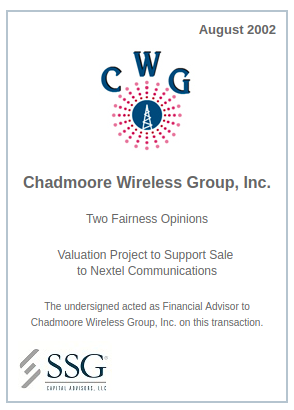 In August 2000, Nextel Communication, Inc (Ticker: NXTL) announced its intention to provide bridge financing then subsequently acquire Chadmoore for $130 million, a substantial premium to Chadmoore’s market value prior to the announcement.